2. Breadcrumb topping: Place all ingredients into a mixing bowl and set aside. 5. Place a skillet over medium heat and cook bacon until crisp. 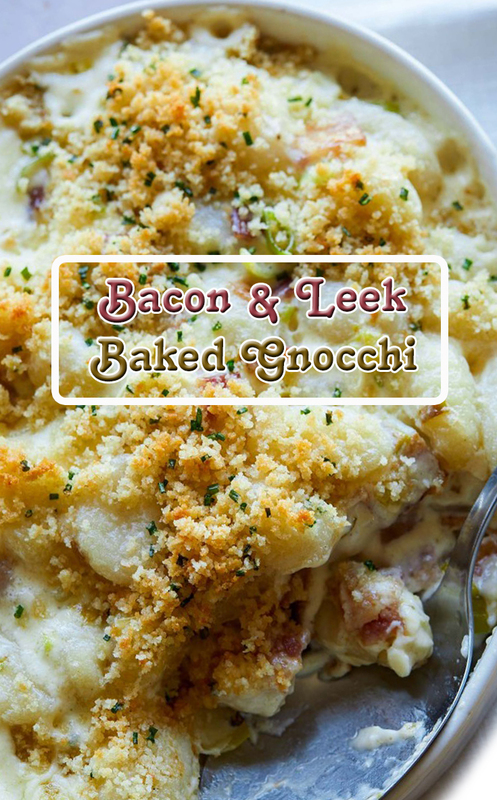 Remove bacon from the skillet, drain on paper towels and set aside with the cooked gnocchi. 6. Degrease skillet and melt butter over medium heat. Add shallots, leeks and garlic and sauté for 3 to 4 minutes. Add milk and simmer. 7. Once the mixture has reduced by 1/3 add cheese and stir. Season with salt and pepper. 8. Add the gnocchi mixture and continue to simmer over low heat for 1 minute. Transfer mixture to a shallow baking dish and top with prepared breadcrumb topping. 9. Bake dish for 12 to 15 minutes or until mixture has thickened and breadcrumbs have nicely browned. 10. Remove dish from the oven, cool for about 7 minutes and serve.